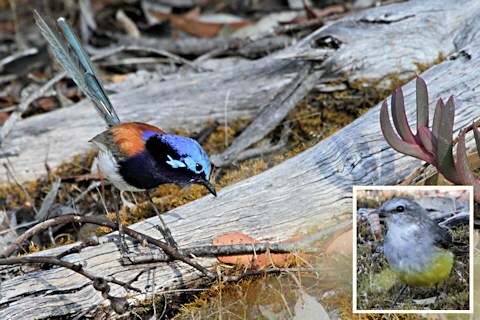 Seconds earlier, the Blue-breasted Fairy-wren had been in seemingly secure possession of a moth fat enough to feed him for a week. Now it was nowhere to be found. This little bird was so intent on finding his missing meal that he either didn't notice me, or wasn't as bothered by my presence as by the fact that his dinner had disappeared. Perhaps he hadn't seen what I saw, that on one of the occasions when he had put the heavy moth down, taking a well-earned break from the arduous task of bashing it into bite-size pieces, a Western Yellow Robin had flown in, grabbed the moth's remains, and quietly shot through with them. Robbed by a robbin' robin after so much effort! The unfairy-wren-ness of it.